In an effort to reduce dependence on Google's Android platform that powers the majority of Samsung's mobile devices, the South Korean tech giant has started domestic sales of TVs powered by its homegrown Tizen operating system. The system enables users to stream content from TVs straight to Samsung Galaxy mobile devices with a single tap. The new TVs come in four sizes, with the smallest model costs $5,000. According to Samsung, the ultra-high definition screen (SUHD) displays over 1 billion colors, which is 64 times more than conventional TVs, and uses "eco-friendly nano-crystal technology." 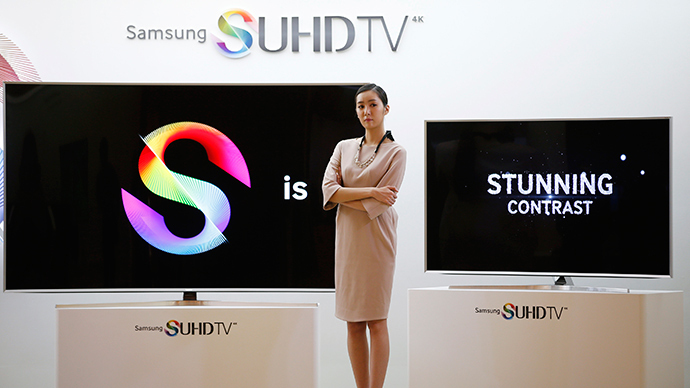 The South Korean company's UHD TVs were first unveiled at the Consumer Electronics Show in Las Vegas in January. Samsung has not revealed yet when SUHD TVs will be launched in Europe and the US. Samsung is the world’s largest maker of televisions, and has about a third of the global market. It saw revenue fall by more than a third in the fourth quarter of 2014 compared to the previous year. The company has been competing against cheaper Chinese rivals, such as Xiaomi, and Apple’s iPhone. Samsung intends to reduce costs on its product line by 25-30 percent in 2015 to make up ground on its closest rivals. The company plans to add washing machines, fridges, air conditioners and robotic vacuum cleaners to the range of products that use Tizen software later this year. Samsung launched its smart home service, enabling users to control and manage their home devices through a single application, in March last year. The service allows smart TVs, home appliances and smartphones to be managed through a single integrated platform. Much like Apple's HomeKit, the Tizen smart home platform is meant to be controlled using a smart phone or, in Samsung's case, the Galaxy Gear 2 smartwatch. Smart Home offers a voice command function on all the controller devices. By saying a phrase "going out" into a Galaxy device, the smart home interface would automatically turn off the lights and the air conditioner. Once back home, saying "I'm home" into your device, and the lights, conditioner and music will turn back on.